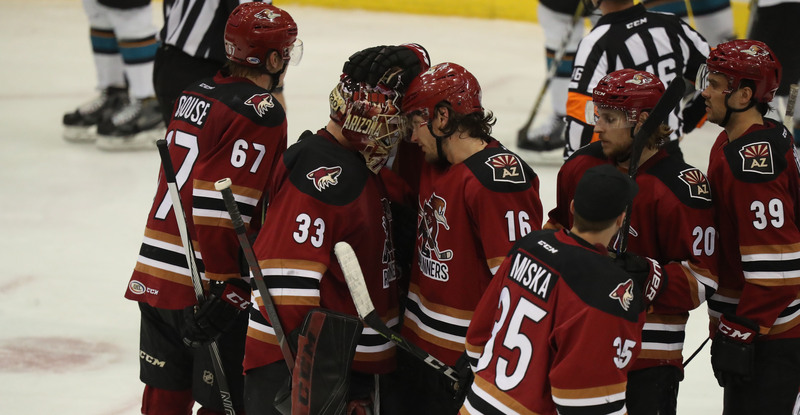 Adin Hill pitched his third shutout of the year, stopping all 20 shots faced to help lift the Roadrunners to a 4-0 victory over the San Jose Barracuda Tuesday night at Tucson Arena. 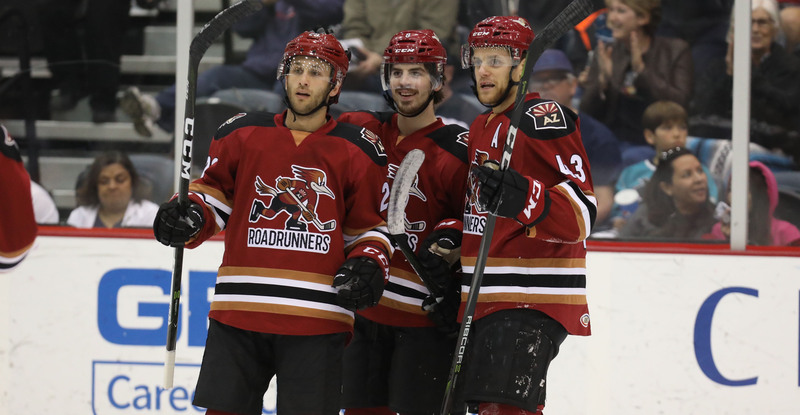 The Roadrunners’ win is their fourth in a row; they’ve now earned points in seven of their last eight games. A balanced effort it was – nine players recording at least a point, including Hill, who picked up his second assist of the campaign. After a quiet opening, the Roadrunners netted a pair of first period goals, jumpstarted by Conor Garland, who was playing in his 100th professional game. While working on a power play, Garland, stationed in the slot, reacted quickly to a loose rebound from a Mike Sislo point shot, shoveling home the night’s opening tally to give the Roadrunners a 1-0 lead just over seven minutes in. With just over six minutes remaining in the opening frame, Lane Pederson tucked home a caromed puck off of a Carter Camper shot, scoring his 11th goal of the season to give the Roadrunners a 2-0 lead. In the early stages of the second, Mario Kempe sped into a lob pass from Conor Garland and skated in alone to register his 16th goal of the campaign, beating San Jose’s Antoine Bibeau with a shifty move to the left to give the Roadrunners a 3-0 lead. Michael Bunting upped the Roadrunners’ lead to 4-0, jamming home a loose puck from in close late in the second. Bunting’s goal, his 17th of the year, was his sixth against the Barracuda this season. Hill turned away all seven shots he faced in the third period to secure the shutout, earning his 16th win of the season. With a goal, a fight, and an assist, Conor Garland earned the acclaimed 'Gordie Howe Hat-Trick'. Lane Pederson finished the night with three points (1G, 2A), the second time he’s done so this year. The Roadrunners will see the San Jose Barracuda for a rematch Wednesday night at Tucson Arena, where the puck is scheduled to drop just after 7:05 PM.